BRITAIN'S Queen Elizabeth II can be heard cracking jokes about US presidents and addressing her own mortality for the first time in new TV show with Sir David Attenborough. 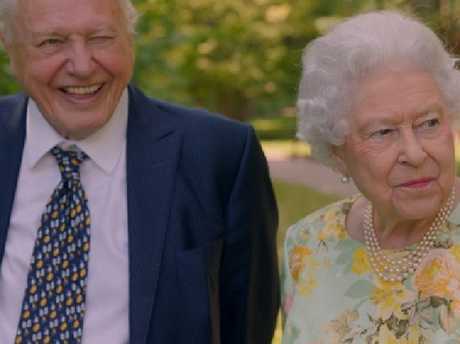 The monarch, who will be 92 on April 21, explores her own garden with the beloved wildlife expert in a new 90 minute show, The Queen's Green Planet, due to air next week in the UK. The two nonagerains born three weeks apart, walk around the gardens of Buckingham Palace looking at trees in the show to highlight her project to create a Queen's Commonwealth Canopy of forests in all 53 Commonwealth states. The Queen and Sir David Attenbrough are born three weeks apart. Picture: ITV/The Queen’s Green Planet. The rare extended interview shows the monarch laughing about a sapling looking worse for wear. "That one we won't look at. Somebody sat on it, I think at a garden party," she said. She also jokes about efforts to "stop children playing conkers" because of "health and safety". Sir David replies: "You would think that, that people would stop people breathing." "Well, it seems to me quite a harmless sort of battle thing," she said. Referring to a helicopter buzzing overhead, the Queen asks: "Why do they always go round and round when you want to talk?" "Sounds like President Trump ... or President Obama." When the pair come across a sundial positioned in the shade which Sir David points out, the Queen seems surprised at the oversight. "Had we thought of that? That it was planted in the shade, it wasn't in the shade originally, I'm sure?" "Maybe we could move it?" 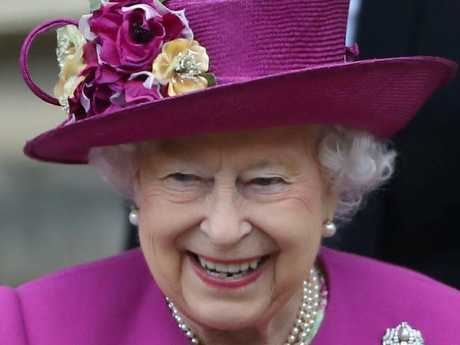 The monarch who has held the throne for 66 years also gives a brief suggestion of her own mortality when talking about climate change after Sir David said there could be "all kinds of different trees" growing in the garden in another fifty years. "It might easily be, yes." she said. "I won't be here though." The Queen also reveals how she eats honey from the hives of her own bees, decorates her own Christmas tree and is quite difficult to give presents to, with trees and roses named in her honour. President Trump has been offered a state visit to the UK to meet the Queen, as President Obama previously did, but has not yet taken up the invitation amid reports of fears over protests. The US leader is expected to visit the UK in 2018 on a "working visit" that may coincide with a NATO meeting in June. The Queen's Green Planet will be broadcast on UK ITV at 9pm on Monday 16 April to coincide with the beginning of the Commonwealth Heads of Government meeting in London.